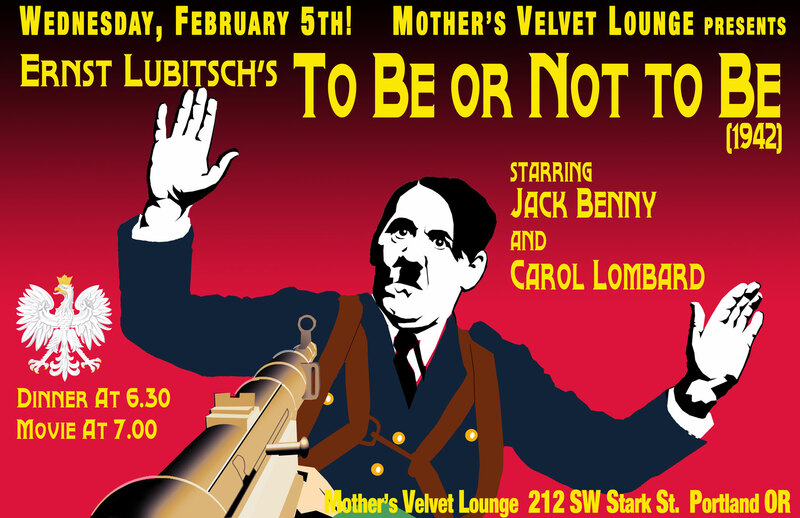 On Wednesday, February 5th, Movies at Mothers returns when we present Ernst Lubitsch’s razor sharp wartime comedy from 1942, To Be or Not to Be, starring Jack Benny and Carole Lombard. Married actors, Joseph (Jack Benny) and Maria Tura (Carole Lombard) run a marginally successful theater company in Warsaw on the eve of the German occupation. Fearing the impending arrival of the Nazis, the theater owners have cancelled the Turas’ original production of an anti-Hitler play and have asked them to instead mount a production of Hamlet with Joseph in the role of the titular Dane. Little does he know that Maria has become involved with a handsome young Polish Air Force pilot, Sobinski (Robert Stack) who eventually involves her in espionage services for the resistance movement. Despite mounting evidence that he is being cuckolded, Joseph leads the theater company in aiding the resistance by donning disguises and doing what they can to defy of the occupational forces, all with a liberal serving of ham. It’s often been said that to successfully create comedy, the dramatic component must be rock solid. Few films illustrate this as clearly as Lubitsch’s film, which could easily have played out as straight-faced wartime drama. The result is that the balance between tense espionage thriller and laugh-out-loud farce is perfectly maintained. In many ways, the film plays even better to the modern audience that it likely did to that of 1942. Though America was certainly at war with Germany by the time the film was released (it should be noted however that it was not at the time of the production), the stakes of that war really became much more evident in its aftermath. 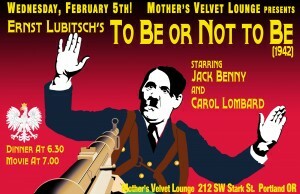 Not a huge success at the time of its release, the film has since risen to the fore of Lubitsch’s legacy and is now hailed as one of the truly great American comedies. Here he found stellar support by his cast with Jack Benny, known almost exclusively to audiences at the time as a radio personality, delivering a wonderful turn as Joseph Tura. He particularly shines in one memorable scene when posing as Col. Erhardt of the Gestapo to fool the traitor, Professor Siletsky (Stanley Ridges) into handing over sensitive information regarding the Resistance. Carole Lombard as Maria matches Benny’s ham with a healthy serving of cheesecake offering a performance full of grace and wit, not to mention an eye-popping wardrobe of form fitting gowns. Tragically, Lombard was killed two months before the film’s release in a plane crash while promoting War Bonds and never saw the finished film, which she told friends was the most gratifying project of her entire career. This is likely Lubitsch’s best looking film as well, with cinematography by the great Rudolph Maté, known for Carl Dreyer’s Passion Of Joan Of Arc and Vampyr as well as Hitchcock’s Foreign Correspondent and Welles’ Lady From Shanghai. The excitement begins at 6:30 when you will enjoy one of the best dinners in town, followed by the screening at 7:00 PM. Hope to see you there! Mother’s is located at 212 SW Stark.